Marcine Evoan Reid, daughter of Robert Albert Reid and Grace Jane Powell and buried in Elmwood Memorial Park Cemetery, Abilene, Taylor County, Texas. 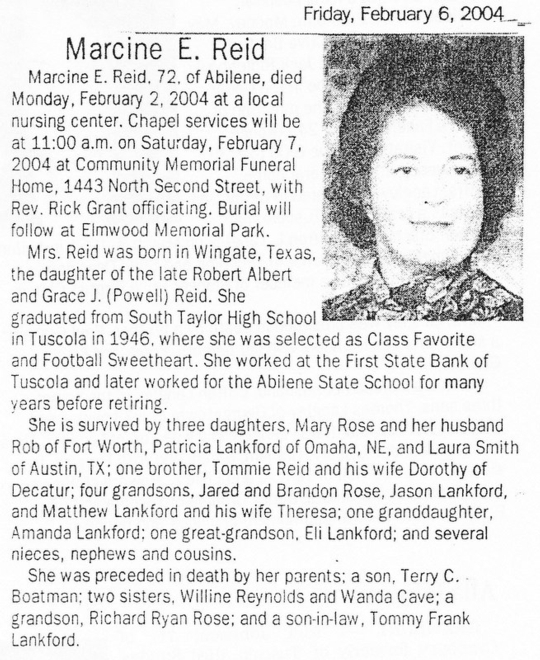 Marcine E. Reid, 72, of Abilene, died Monday, February 2, 2004 at a local nursing center. Chapel services will be at 11:00 a.m. on Saturday, February 7, 2004 at Community Memorial Funeral Home, 1443 North Second Street, with Rev. Rick Grant officiating. Burial will follow at Elmwood Memorial Park. Mrs. Reid was born in Wingate, Texas, the daughter of the late Robert Albert and Grace J. (Powell) Reid. She graduated from South Taylor High School in Tuscola in 1946, where she was selected as Class Favorite and Football Sweetheart. She worked at the First State Bank of Tuscola and later worked for the Abilene State School for many years before retiring. She is survived by three daughters, Mary Rose and her husband Rob of Fort Worth, Patricia Lankford of Omaha, NE, and Laura Smith of Austin, TX; one brother, Tommie Reid and his wife Dorothy of Decatur; four grandsons, Jared and Brandon Rose, Jason Lankford, and Matthew Lankford and his wife Theresa; one granddaughter, Amanda Lankford; one great-grandson, Eli Lankford; and several nieces, nephews and cousins. She was preceded in death by her parents; a son, Terry C. Boatman; two sisters, Willine Reynolds and Wanda Cave; a grandson, Richard Ryan Rose; and a son-in-law, Tommy Frank Lankford. Visitation will be Friday, February 6, from 5 to 7 p.m. at the funeral home. Memorials may be made to Meals on Wheels Plus, P.O. Box 903, Abilene, TX 79604. The family would like to extend a special "Thank You" to Debra King for her love and support.